At first I thought it was all in her head. There wasn't enough girl drama in 2nd grade so it was spilling over to the birds. There are three of them. Peaches, Zebra and Finch (Finn for short). 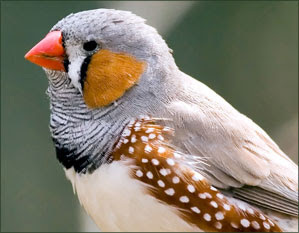 They are (surprise) zebra finches. And they seemed to get along just fine whenever I was watching them flit about in the cage. Alia insisted otherwise. She claimed that Finn was mean, picking on Zebra. After a few weeks, we did notice that Zebra was no longer sleeping in the nest with the other two. That he often was segregated from them during the day. Sometimes at night, Alia would come crying to our room, claiming that Finn was being mean to Zebra and she couldn't take it anymore. We would wander in to her room and it seemed like everything was okay -- except for Zebra sleeping in the green hanging ball usually reserved for hay. Some time two weeks ago, because I didn't feel like reading, watching TV, playing on the computer, I sat on the bean bag in Alia's room and observed the birds. I have no clue where my family was but apparently they were gone or occupied so I must have been watching the birds for at least an hour. They are fun to watch. Clicking and swinging and moving about. I started to notice that Finn was chasing Zebra. And not in a nice way. He kept charging him. Zebra would move to the far end. Chased. Far end. Chased. Far end. Chased. Peaches just stayed out of the way. Fast forward: two days ago Rob informed me that Zebra has been getting pecked by Finn so much that his chest/neck feathers are missing. Yesterday, Rob bought a small, cheap cage and moved Finn to his new home. Finn's new home is now hanging in Alia's room, and Zebra and Peaches are living peacefully in the original cage. Apparently, the first thing Zebra did was hop into the nest (as he hasn't been allowed to sleep there for a month or so) and take a nap. As for me...feeling a little guilty that I wrote off Alia's initial concerns as bird drama. This is NOT Zebra but this is what he looks like. Poor Zebra! Thank goodness Alia is such a good bird keeper and noticed! Now she gets two cages of birdy fun! so wild that you bought finches! I keep passing by the birds in the pet store showing them to Kara and she likes the finches the most, we watch them when ever we take Duke to the vet or groomers there. The last couple of times I have wanted to buy two of the finches...but haven't. Maybe Kara can visit with your Finches?